Music Director Morales-Matos and members of the Central Ohio Symphony Brass and Percussion Ensemble performed in Sunbury at Community Library last Friday evening. 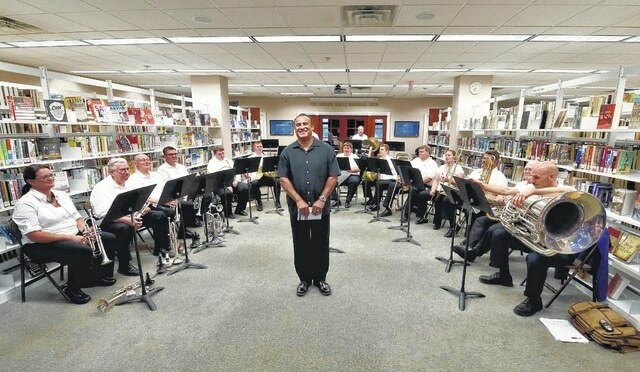 As part of its Summer Solstice Music Festival, the Central Ohio Symphony Brass and Percussion Ensemble performed in Sunbury at Community Library last Friday evening. The concert was planned for outdoors on the grassy hillside beside the library, but the weather didn’t cooperate. Library staff gathered every available chair in the building, enough for the over 100 community members who attended the concert held in the library’s central hallway in front of the Burrer Family Memorial Room. Music Director Morales-Matos, a noted trombonist, who conducted and performed with the ensemble, led the Symphony Brass, a group of 18 brass and percussion musicians, as they played classic, patriotic and pops selections. The Delaware County Foundation and the Ohio Arts Council funded the Summer Solstice Music Festival concert, part of a weeklong festival by the Symphony in Delaware and surrounding communities, with assistance organizing the Sunbury concert provided by the Sunbury/Big Walnut Area Chamber of Commerce. For the past 35 years, the Central Ohio Symphony has served the Central Ohio community. Over the years, the ensemble has matured from a small volunteer group to a 65-member professional ensemble. Large crowds regularly attend its holiday concerts and its free, outdoor July 4th concert draws thousands from all over Central Ohio. The Central Ohio Symphony has the distinction of being the only orchestra in Ohio with a budget of less than $1.5 million whose performances on tour are supported by the Ohio Arts Council. For more information about the Central Ohio Symphony call the symphony office at (740) 362-1799. The Central Ohio Symphony website is located at < centralohiosymphony.org >.